Moving to a new country and learning to adjust to a new way of life is one of the most valuable experiences in life. It opens you to view the people and world around you in new ways that you would have never considered if you hadn’t lived abroad, and can make you a very well-rounded person capable of deeply understanding people of different cultures. 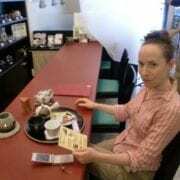 About Erica: She completed the 250-hour TESOL Diploma after teaching English in Japan for more than 9 years. Getting used to an entirely different world view can be quite a challenge in any country. The Japanese work very long hours, so it can be very sad to watch them work so hard that they can’t care for themselves properly. Also, the quality of public ESL education in Japan is extremely low. They are working with a very outdated (over 60 years old) method of ESL instruction, so it can be quite frustrating to see the old system in place when you know a much better way to teach. The TESOL course showed me that what I saw happening in public schools in Japan was an outdated system for teaching, and provided me with clear guidelines for how to teach in an effective and step-by-step manner. I started teaching ESL in Japan before getting my TESOL certification, so my experience in Japan didn’t change my perspective on teaching ESL. Instead, getting TESOL certified changed my perspective on the teaching methods I developed in Japan. Learning how to adapt to a new culture was one of the greatest lessons of my life. At one point I became very frustrated with the Japanese culture, and there were many things that didn’t make sense to me. But I stuck through it and tried to understand as best as I could by learning the language and making friends with many different people. In time, I learned to see both the good and the bad without judgment, which allowed me to enjoy the culture fully. It also showed me how to see the good and bad of my home country (USA) in a new light, and made me a much more cultured person. I’d recommend getting TESOL certified before going, and committing to studying the native language of the country you’re in. Regardless of whether or not you use the students’ language in the classroom, the process of learning a new language will help you to understand how your students feel, the frustrations they go through, and will also show you what actually is effective in language learning and what is not effective.